I attended Leaders for Leeds this morning – a breakfast meeting that connects a group of people who are trying to work on achieving ‘best city’ outcomes, aka make Leeds a better place to live. I jotted down a few notes, some taken from our conversations and some capturing thoughts that I didn’t have time to express, and these form the basis of what I have written here. What do we mean by community? Geography? Interest group? Ethnic group? Faith based group? Age group? Community is a weasel word. We can utter it with gravity and credibility while conferring on it no specific meaning. It is a broad signaller of intent, with no specific commitment or rationale attached. I reckon what we actually mean by ‘community’ is often ‘target population’. Except Leaders for Leeds has no ‘targets’. We are not clear on whose voice we want in the room and why. We don’t know whose voices are missing. If ‘they’ were present what would they say and do? How would that help? Who would that help? ‘Community Leader’ is an equally difficult term. Often it is little more than a media label applied to someone who expresses an opinion about a community issue. They may lead a project, or an organisation, but do they lead a community? Leadership is usually contested. They might lead some but not others in ‘the community’! We also discussed how bestowing the title of community leader can be damaging to the individual concerned and their relationships in the community. Few are prepared to put themselves forward as community leaders. The label does not fit. They don’t recognise it. Call yourself a community leader, or be called it by someone else, and you risk getting a backlash. We also talked about ‘community leaders’ who are appointed or recruited, either from the community or into the community, to do a specific job for a particular sponsor in ‘the community’ and how seldom they seem to become effective catalysts for lasting change. So why the interest in ‘community leaders’? Is it because it is a convenient idea? If we can find them they provide a short cut to ‘engage with community’? Are we looking for individuals who have respect and influence in communities that we don’t? Are we looking to extend our power and reach through them? Or is it because we believe in the ‘law of requisite variety‘ that says the more diverse our membership the greater the diversity of the issues that we can respond to effectively? That we recognise deeply that unless we get more diverse membership our capacity to act as change agents is limited. 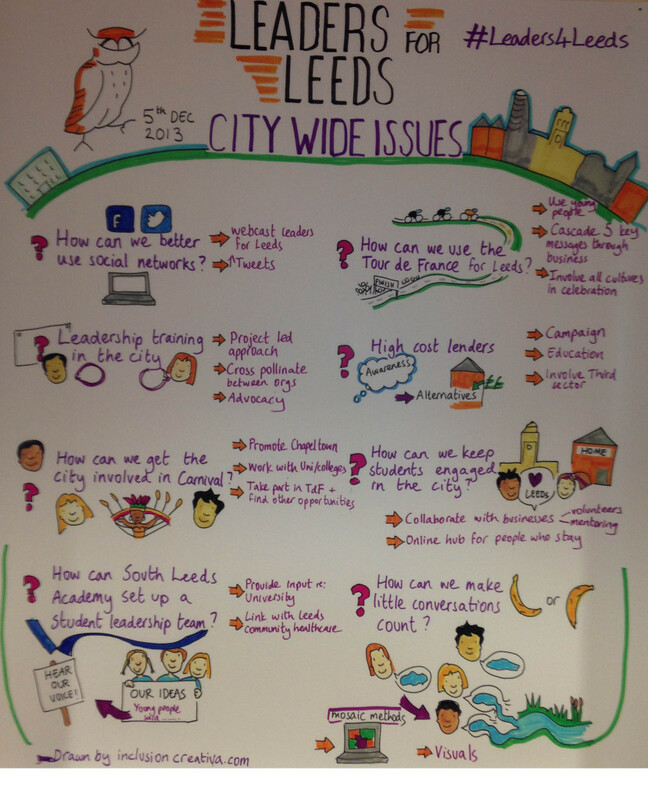 We also heard how for one participant how attendance at Leaders for Leeds was largely symbolic. They got little from it themselves, but their attendance served as a reminder that black and minority ethnic people are here. Conversation then turned away from leadership and towards the issue of power. Are we seeking to give those that ‘organise’ in our communities more power to work on what matters to them? Can we do that? How? Or are we seeking power for ourselves to influence and create change in those communities by finding individuals to act as bridgeheads for us and our projects? We then talked about Leaders for Leeds providing access to those in power and also about providing a broader perspective of the city as public, private and third sector gather together. The issue of access to those in power was interesting to me. Do we believe that if we can relate to them and influence them we can secure different outcomes? Is that the game plan? That what we need to do is persuade those in power? Do we believe that power is essentially wielded from the top down? Or could we conceive of Leaders for Leeds as a mechanism that serves the voices and needs of ordinary citizens – giving them power to shape their own futures and recognising how we might often need to get out of the way? A city of 750 000 voices rather than ONE? How do we enable small groups of people that care to have conversations that lead to action? How can we encourage them and amplify their power to transform lives for those that most need change? So I guess it comes down to one big question for me: Is Leaders for Leeds there to help existing power structures to cope with change? Or is it there to help them change? Perhaps radically? Not a bad bit of brain tickling from a 20 minute conversation! Whether it is more ‘civic enterprise’, community engagement or ‘Big Society’, people with power, but increasingly little money, are looking for new ways to get things done. The large capital infrastructure projects have not given us more inclusive communities and now we can’t afford them any way, so in some quarters at least interest is shifting from old school top down strategy to a more emergent process of bottom up development. To processes where large numbers of people can shape their own futures and as a result the futures of the communities that they live in. But making the shift from top down to bottom up is far from easy…. These are my best efforts to provide an infrastructure that allows the private, public, third sector and those of ‘no sector’ to give and get the help that they need to develop enterprising projects and people, and for the development of ‘community’ by building relationships and networks around local activists. To bring ‘bottom up’ development to life.